This type of cloud is responsible for the destruction of atmospheric ozone. They create conditions that release chlorine from chlorofluorocarbons (CFC's) which reacts with and destroys ozone throughout the Antarctic winter when these clouds develop, they are maintained by the "polar vortex" a circumpolar wind that isolates Antarctic weather from the rest of the world so giving them longer to have their effect on the trapped ozone being depleted. 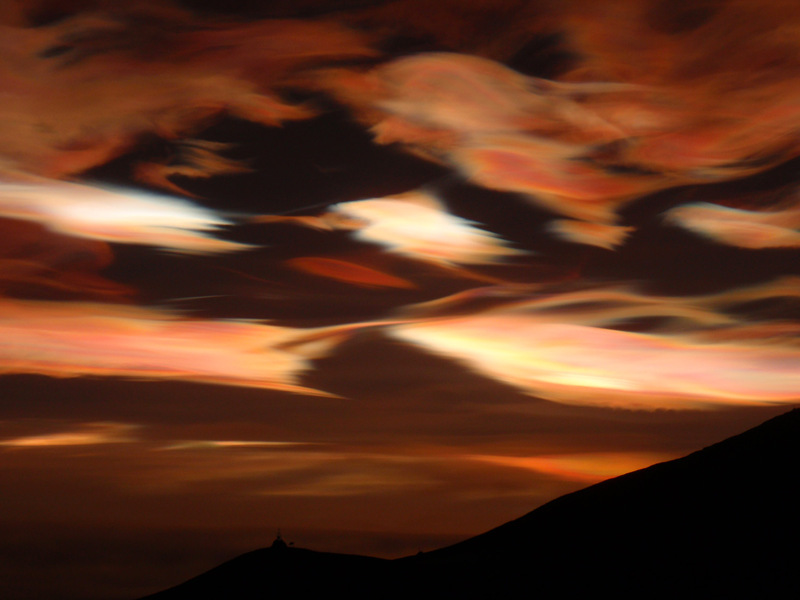 There are two kinds of Polar Stratospheric Clouds, those that form at about -78°C (-108°F) contain nitric acid and water crystals and possibly sulphuric acid, while those that start to form at about -85°C (-121°F) have more water crystals. Picture taken 23/08/2009 15.32 - McMurdo Antarctica.